Today's toaster ovens are often equipped with convection fans and can take full pizzas of 12 inches or more. Check out the latest toaster ovens analyzed and compared by AlphaChooser. 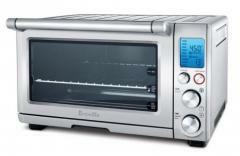 Currently, the best toaster oven 2019 is the Breville Smart Oven Pro, followed by the Breville BOV900BSS. Here is the full top 10 list, then sub-categories and an extensive list of toaster oven brands and models. Considering this toaster oven's aggregate ranking of 93%, we believe that the Breville Smart Oven Pro is, as of now, Alphachooser's best toaster oven 2019. Furthermore, we think that our sample of 2078 reviews from our sources gives us a high confidence level (more on confidence levels) that pushes us to call it a "no-brainer best choice." 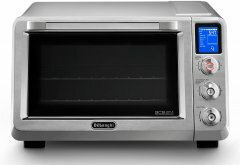 With its 4.5 stars computed from 450 reviews, here is second best toaster oven. * These choices are based on a full analysis of hundreds of toaster oven reviews from across the web. 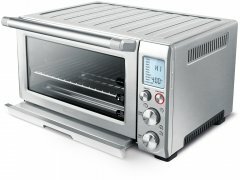 The Hamilton Beach 31240 is the newest toaster oven by Hamilton Beach. All Hamilton Beach toaster ovens. The Oster TSSTTVFDDG-B is the latest Oster toaster oven. The Black and Decker TO3290XSD is the latest Black and Decker model. All Black and Decker toaster ovens. The Cuisinart TOB-1010 is the latest model by Cuisinart. The Maxi-Matic ERO-2600R is the latest Maxi-Matic toaster oven. The KitchenAid KCO253CU is the newest KitchenAid model. The DeLonghi EO241250M is the newest DeLonghi one. The Breville BOV900BSS is the newest model by Breville. The Waring WTO180CMR is the latest Waring model. The Avanti PO81BA is the latest Avanti one. The Kenmore Elite 125099 is the newest Kenmore model. The NutriChef PKMFT027 is the newest NutriChef toaster oven. 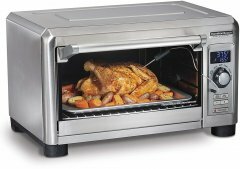 The Ronco EZ-Store Rotisserie 5250 is the latest toaster oven by Ronco. The Sunpentown BM-1107 is the latest SPT one. The Proctor Silex 31122 is the latest Proctor Silex toaster oven. All Proctor Silex toaster ovens. The Toshiba AC25CEW-BS is the latest Toshiba toaster oven. The Bella 90060 is the newest Bella model. The West Bend 74106 6-Slice is the latest West Bend one. All West Bend toaster ovens. The Premium 6-slice is the newest model by Premium. The Fagor Dual Technology Digital is the newest model by Fagor. The Tiger KAJ-B10U is the latest Tiger one. The Nostalgia Electrics RTOV220 is the latest model by Nostalgia Electrics. All Nostalgia Electrics toaster ovens. The Rosewill RHTO-13001 is the latest Rosewill model. The Panasonic NU-HX100S is the newest model by Panasonic. The KRUPS OK505D51 is the latest KRUPS one. The Calphalon TSCLTRDG1 is the latest Calphalon one. 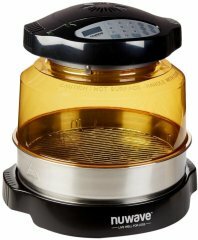 The NuWave Bravo is the latest NuWave toaster oven. The Dash DMTO100GBAQ04 is the newest toaster oven by Dash. A small convection toaster oven that Dualit claims can reach 446 degrees Fahrenheit in five minutes behind its double-insulated glass door. Stainless toaster oven with quartz technology, a convection fan, and a special cooking rack which apparently helps cook faster. 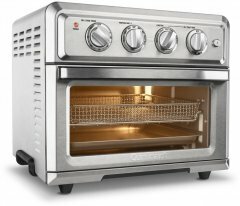 A 1500-watt countertop convection toaster oven with an average capacity of 0.9 cubic feet and claiming an unspecified energy efficiency. An incredibly basic 700-watt four-slice toaster available in four different colors, namely black, white, red, and black with silver. 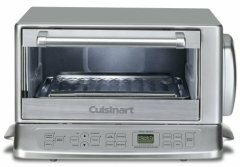 An innovative toaster oven that tries to combine the time saving qualities of pressure cookers and the cooking features of a conventional oven.